(Updated) The Metropolitan Opera had not staged a production of Gioachino Rossini's "Guillaume Tell" in eight decades. Not in my lifetime. The composer's final opera, though considered one of his great ones (nearly up there with "The Barber of Seville"), is a lengthy and complicated endeavor. While few people have seen the opera in a live production, most everyone knows the famous overture. Members of the post-war generation and Baby boomers associate the William Tell Overture with the Lone Ranger and his trusty sidekick, Tonto. 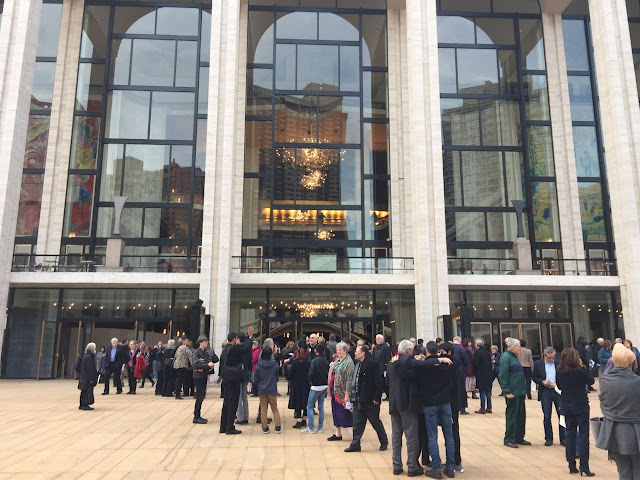 Outside the Metropolitan Opera House before the performance. Saturday, October 29, 2016. 11:34 a.m. 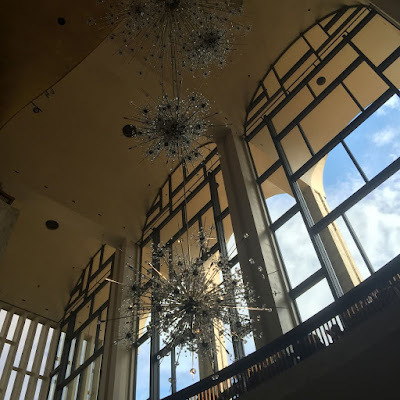 The Met's production is estimated to run about four hours and thirty-six minutes. The first intermission is scheduled for 30 minutes and a second intermission for 40 minutes. The final act wraps up quickly at 26 minutes, but that's when a lot of beautiful music takes place. Except it didn't quite work out that way for the matinee performance on the afternoon of October 29, 2016. Outside during 1st intermission. 1:24 p.m. I enjoy going to the Met at any time, but I thought I would also use the occasion to share with you some of the visual experience of attending a performance there. Before the performance, the scene was festive outside the theater. 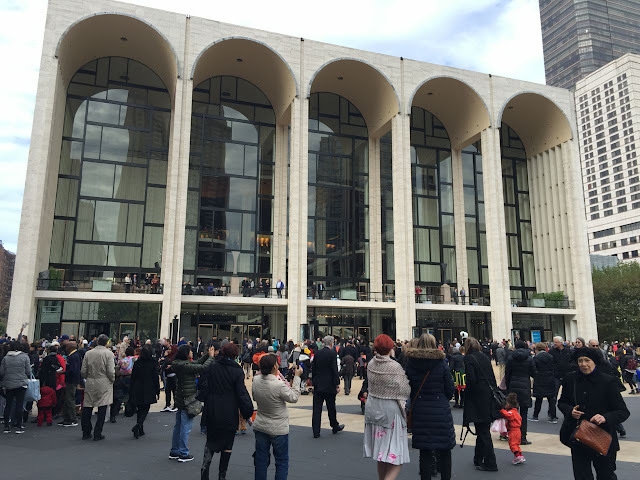 Lincoln Center was hosting a trick-or-treat event for kids, and hundreds of them were running around in their cute little princess and spaceman outfits. The Met crowd, typically older, steadily filed into the theater in their predominantly black opera-going costumes. I located my place on the back row of the orchestra, a new seat for me, but I highly recommend Row EE. You have a straight-on view of the stage, along with the creature comforts of sitting on the back row. During first intermission. Chandeliers. 1:34 p.m. I won't go into too much of the performance, other than to say the singers (Gerald Finley, Bryan Hymel, Marina Rebeka) were quite wonderful, the orchestra was excellent (the famous overture rousing! ), and the abstract sets were fine with me, although many people didn't care for them. During intermissions at the Met Opera, you are welcome to leave the theater, but you need to acquire a card to show the ushers when you go back in. There's plenty to see inside - the opulent chandeliers in the lobby, the opera shop, several galleries with opera-related art, and well-placed bars with drinks and food (albeit on the expensive side. A chicken sandwich + water = $20). 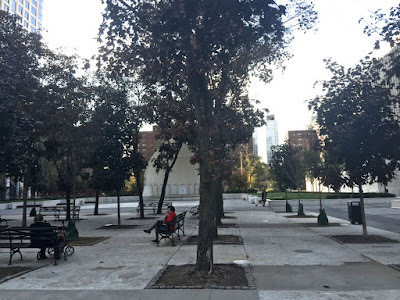 Outside the theater, wander over to the grove of trees on the north side of the theater or to Damrosch Park on the south side. 2nd intermission Damrosch Park 3:24 p.m. The only thing I really took exception to in the Met production of the opera was its disparaging portrayal of the flâneur. To contrast the good-hearted and nature-loving peasants of Switzerland, the Met depicted their citified oppressors as mean Viennese snobs in black flâneur outfits. During the tedious ballet segment, they had the flâneurs beat the Swiss into dancing the way of the Austrians. 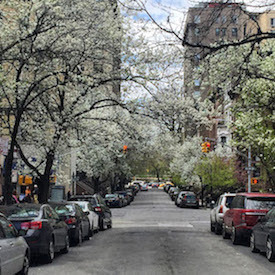 I'm all for raising consciousness about the cultural means of oppression, but going after the boulevardiers offends the sensibility of proud city sophisticates. 2nd intermission. 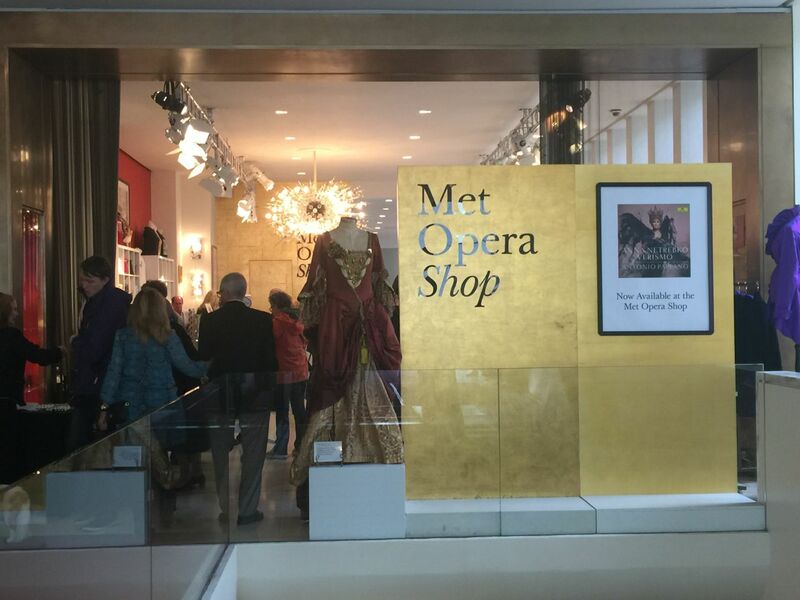 Met Opera Shop. 3:48 p.m.
2nd intermission. View of upper balcony lobbies. 3:51 p.m. Settled back in my seat for the final act, anticipating the wonderful music ahead, the intermission grew longer and longer. Rustling of papers. People standing up to stretch. An official from The Met finally took the stage - always a bad sign - and announced that there would be a delay, thanked us for our patience, and indicated the production would resume shortly. More time passed. And more time. Two security officers took their places on either side of the stage. A little odd. The audience started growing restless. Some got up and left. Trains to catch. Dinner reservations. Then many of the well-heeled crowd began the clapping. That's always an ominous sign of trouble (though fun, in its way). Was someone in the cast sick? Did the abstract set fall apart? Was the curtain stuck? Did someone lose control of the dry ice machine? The same official returned to the stage, announced that everyone was healthy and well (applause), but that the remainder of the performance needed to be canceled (no applause). That was it. No more said. Well, well. Most everyone reacted fairly politely, considering they paid good money to see the opera and had already sat through four hours of it and needed closure. William Tell had already shot the arrow off his child's head, so that bit of drama was done, but what of the beautiful singing in the final act? Last act cancelled. 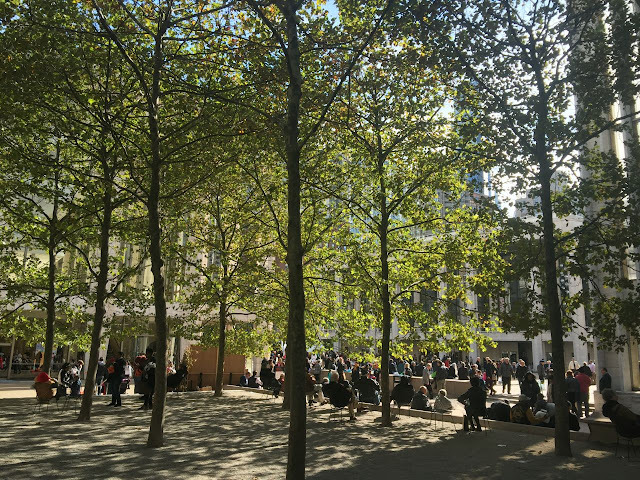 Outside the Met. 4:43 p.m. The audience filed out of the theater. It was bizarre to have the opera end that way. At trying times such as these, Twitter becomes quite useful. Bizarre thing at #MetOpera. They just cancelled the last act of the performance & didn't tell the audience why. 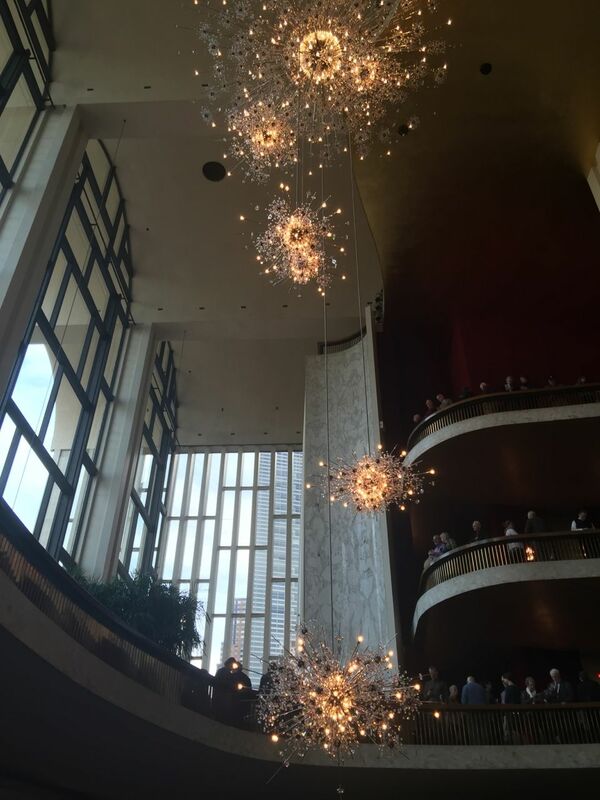 They did say no one was ill.
.@MetOpera why did you cancel the last act of this afternoon's opera? Many people remained outside the theater to speculate on what happened. We didn't know. Better just leave. Leaving the opera. 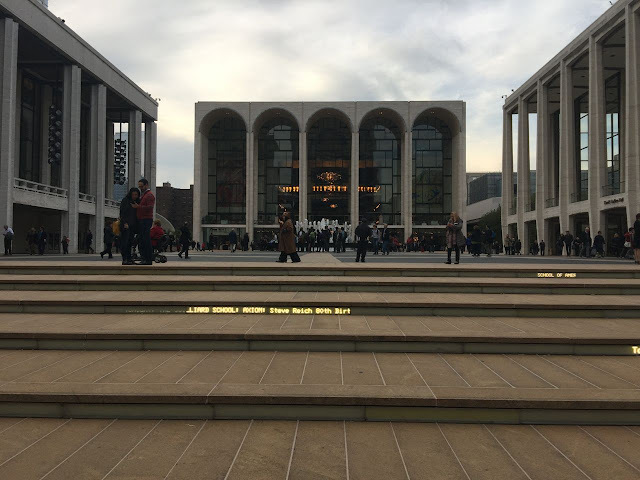 4:44 p.m.
Steps of Lincoln Center. 4:48 p.m.
On the train back uptown, as I followed along with Twitter updates on the situation, the mystery of the Met Opera's cancelled last act of "Guillaime Tell" began to unfurl. The plot thickened. 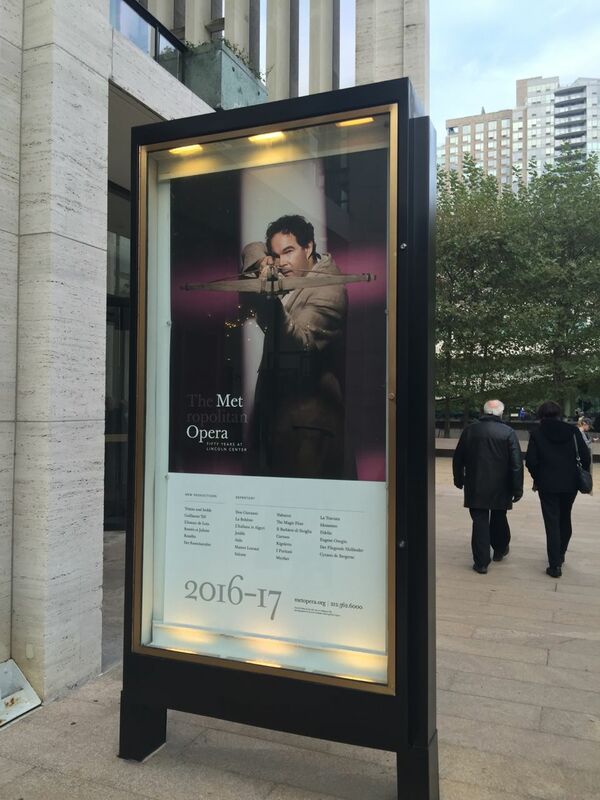 OFFICIAL: @MetOpera cancels remainder of "Guillaume Tell" after an audience member sprinkled an unidentified powder into the orchestra pit. "Unidentified white powder"?!! Into the pit? Glad to be away from there. Within a couple of hours, what transpired had become more clear. What did happen? THIS - A man from out of town had sprinkled the ashes of his opera-loving mentor into the orchestra pit! For more on the story, see the October 30, 2016 story from The New York Times - "Powder Tossed at Metropolitan Opera May Have Been Human Ashes, Police Say." And that was my afternoon at the opera. 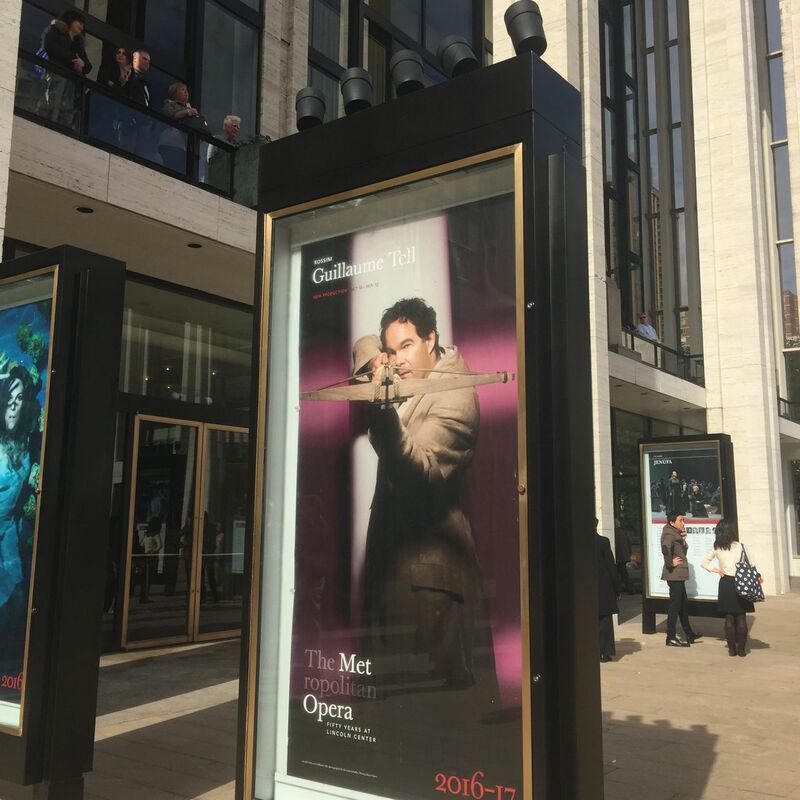 The Met invited those in attendance to reschedule "Guillaume Tell" for a later date. 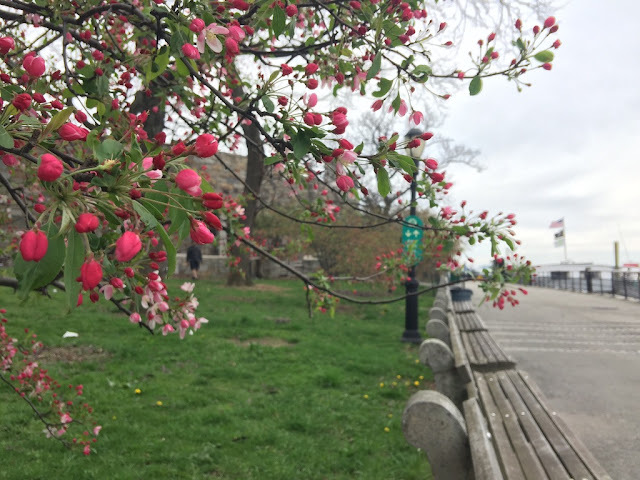 Images by Walking Off the Big Apple from October 29, 2016.